Treasure Island first responders are hopeful that a new partnership aimed at curbing repeated 911 calls about homeless people passed out in the streets will not only save money, but also lives. 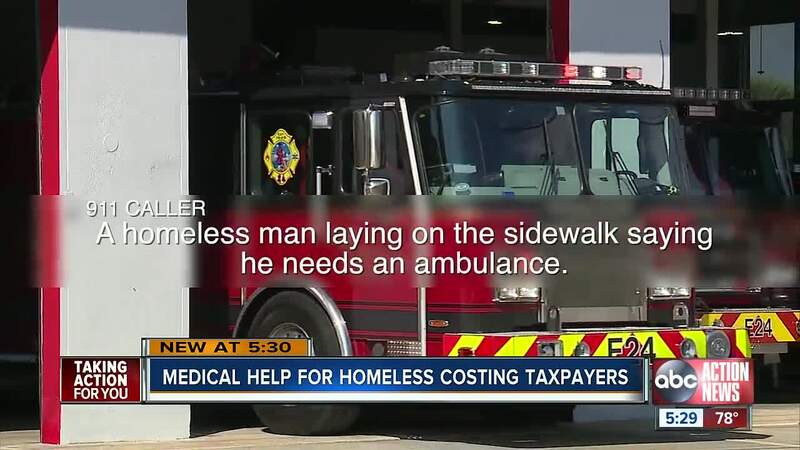 TREASURE ISLAND, Fla. — Treasure Island first responders are hopeful that a new partnership aimed at curbing repeated 911 calls about homeless people passed out in the streets will not only save money, but also lives. The first respondes say it's a big problem, every day they get repeated 911 calls about the issue. Most of the cases they see are because of substance abuse. The say the issue is that many of these people end up back on the streets just hours later, and it’s costing resources and taxpayer money. “You have to do something to stay sane and unfortunately a lot of times that leads to alcohol substance abuse," said William David Harris. He's been homeless for 16 years. But it's happening too often and at a big cost. Barrs says Treasure Island Fire Rescue and Treasure Island Police have teamed up with five agencies including Turning Point, the Salvation Army, Operation Par, SOAR program and Footprints Beachside Recovery to empower first responders. Treasure Island has no soup kitchens and no shelters. Meaning, first responders have no help to offer the homeless patients besides the hospital. Barrs says he wanted to find a way to get at the root cause of the problem, and that’s addressing homelessness and substance abuse. He says their worst repeat offender is a patient they had to transport to the hospital more than 140 times in one year. They estimated the cost to be nearly $110,000 between an ambulance, response from paramedics and treatment. “You’ve got voluntary homeless and you have people that are screaming for help," said Harris. Treasure Island has no soup kitchen and no shelter. Barrs says before this partnership a hospital was the only option. Now, they can offer them substance abuse help, mental health treatment and counseling. The partnership is only six-weeks old, but in the case of their worst repeat offender, Barrs says the man accepted the help and has been off the streets for about three weeks. "If you have 10 people and you save one life you succeeded," said Harris. A mother of a homeless man even writing to the Treasure Island Police Chief. In an email she wrote: "I have tried to get the help he neeeds for I love him deeply. Without these officer's help I don't even want to imagine his fate."